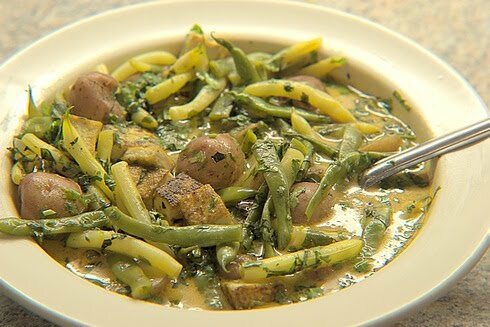 This is a fairly quick, and very adaptable recipe. I made it vegetarian (except for the fish sauce - see substitution below if you want it totally vegetarian), using tofu for the protein, but it would work well with shrimp or chicken. 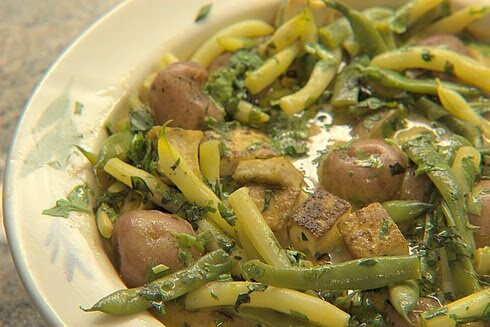 I used green and yellow string beans and potatoes for the vegetables - other good ones would be carrots, bell peppers, peas, maybe eggplant...lots of possible variations. If you make this, let me know what you used! We used a prepared curry paste that we bought at Whole Foods, (or a similar store - can't quite remember). I would like to make my own at some point, but haven't tried it yet. Some cooking notes: I like to pan fry the tofu so that it develops a nice crust and retains some texture when it is mixed with the coconut milk. Make sure to pat it dry before this step. For the potatoes, there isn't enough liquid to submerge them to simmer in the coconut milk mixture, so I like to pre-cook them, either by steaming or microwaving. In a heavy skillet (cast iron works great), heat vegetable oil (enough to coat bottom of skillet) over medium-high heat until very hot but not smoking. 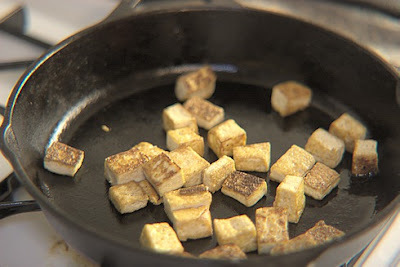 Add tofu and cook, tossing frequently, until tofu develops a golden-brown crust. Meanwhile, steam potatoes until just barely tender. If you are cooking rice, it works nicely to do the steaming at the same time. In a large saucepan, simmer coconut milk, ginger, and red curry paste over medium heat for 5 minutes. Add fish sauce, brown sugar, and 1/3 cup water and simmer for 5 minutes. Add beans and simmer for 5 more minutes. Add potatoes and tofu and cook until heated through (make sure potatoes are fully tender at this point). Remove ginger, and top with basil and cilantro. Serve hot with rice. Huh, I thought I commented on this post before but I guess not! I was never very happy with dishes I made with curry paste until I started using the imported Thai brands (Maesri in cans and Maoploy in tubs). Not very local, but then neither is Thai Kitchen, I guess. You can buy it at local businesses at Christina's Spices and the Cambridge location of Savenors. I also have more than I can use before I move- I'll bring in a can or two. Cool - thanks for the tip. I really want to start making my own curry paste so I can adjust it to my taste!